I will be the first to admit that I am not a tennis fan. However, seeing as this week/weekend is the 125th year that the grand slam tennis tournament is being played at Wimbledon (located in Merton, England) it’s hard not to be a little excited. In honor of this age-old sporting tradition, here are a few clever facts about the event…. King George VI (Colin Firth’s character in The King’s Speech) played in the 1926 Wimbledon championships while he was still the Duke of York. He lost in the first round. The 19 courts at Wimbledon are all made of real grass – 100% rye grass to be exact. During the championship, the courts are mown, rolled and relined each day, and showered with 3,000 gallons of water. The trophy for the men’s singles has a pineapple design on the top. 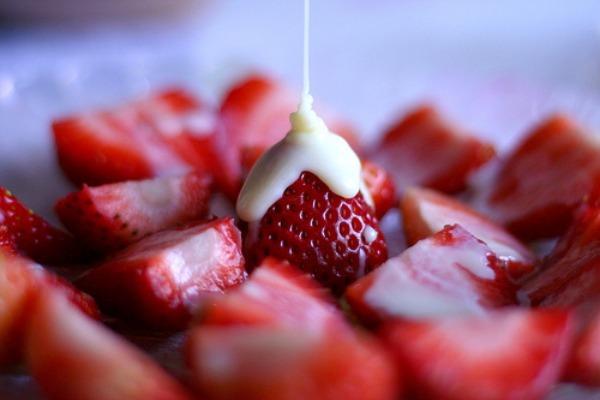 Strawberries and cream is one of the traditional symbols of the championships. They are freshly picked each day from the “Garden of England” and are served throughout the tournament. Ladies’ singles finals will be held on Saturday, July 2, while Men’s singles finals will be held on Sunday, July 3. View more key dates for Wimbledon.